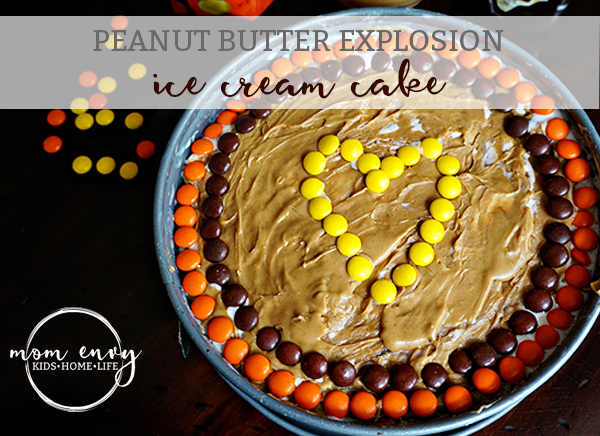 Today I am sharing one of my husband’s favorite desserts, Peanut Butter Explosion Ice Cream Cake. I started to make ice cream cakes a few years ago out of necessity because my husband is really not a cake person (I know, he’s crazy). And in our house, peanut butter and ice cream go together even better than peanut butter and jelly. Supposedly ice cream with peanut butter is a strange concept in other parts of the country. So if you’re weird a peanut butter ice cream rookie, give it a try! I was surprised at how easy it is to make your own ice cream cake at home. 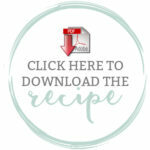 Even though this recipe is peanut butter-overload, it can be modified to any flavor you desire! Here is a quick little video demonstrating how to make the ice cream cake. Carl was extremely interested in the cake as you can see near the end. Keep the Oreos coarse rather than pulverizing them until they’re powder. This is a very important tip for an ice cream cake. After making my first cake, we found the powder-like Oreo crumbs created a crust too hard to cut without letting the cake sit out to soften for way too long (melty cake = too messy). Also, don’t use Double-Stuffed Oreos. I know, regular-stuffed Oreos just aren’t as delicious. Problem is, the double stuffed is not the best at making crusts. Use this concept as a venue to make any flavored ice cream cake you desire. You could even change out the peanut butter oreos for golden oreos or other flavored ones or go with traditional graham crackers. The magic shell isn’t a necessity if you’d like to create a non-chocolate cake. Place Oreo inside of a gallon size Ziploc bag. Use a mallet or hard object to crush the Oreos. Stop when the Oreos are semi-coarse (some finer crumbs, some larger crumbs, but no large pieces left). If using a food processor, leave them semi-coarse. Pour the Oreo crumbs into a spring-form pan (9 in. or 10 in.). Pour over Oreo crumbs and mix well. Press the crumb mixture to compact it against the bottom of the pan, creating a crust. Spoon half of the softened ice cream into the pan. Smooth the ice cream. Melt 1/2 cup of peanut butter (about 20-30 seconds in the microwave). Pour onto the ice cream. Smooth out. Drizzle magic shell over the peanut butter. Remove from freezer after the peanut butter/magic shell layer has hardened. Scoop the remaining softened ice cream on top of the magic shell/peanut butter layer. Smooth ice cream. Melt 1/2 cup of peanut butter. Pour onto ice cream. Smooth out. Return to freezer for at least an hour to set-up. Want to make me later? Pin me!